On Saturday I was surrounded by more aisles and products than I knew what to do with. I found cloves. I found bags of tortilla chips for 1 Euro. I found Moevenpick ice cream for the equivalent of SFr 3,50. I was in heaven otherwise known as the border German grocery store. 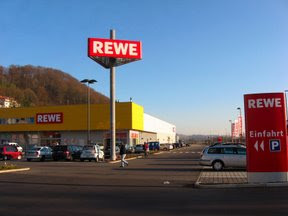 As I was unloading the groceries from my cart at the check-out, the cashier said something to me that I couldn't quite hear above the din of hundreds of other Swiss and German shoppers around me. The cashier repeated her statement. I realized that she wanted me to remove my wet umbrella from my grocery cart so she could check that I wasn't stealing anything. As I picked up the umbrella, all I could think was, wow. I had almost forgotten what it was like to not be trusted. Switzerland may be high on cost, but unlike its more affordable German neighbor, it is also high on trust. I had forgotten how nice a society of trust is. I still enjoyed my German-priced Swiss ice cream, though. But I will say that we loved the trust in Switzerland. Especially when Brian lost his keys during a jog and, 4 days later, they were at the local police station. Awesome. What I like about boarder shopping is the Pillsbury fridge rolls you can get at the Rewe. Oh and the chocolate covered oreo cookies. Glad to hear you're enjoying American grocery stores, Mrs. Mac. We miss you in the Swiss blogging world. Ah, just like being back home, huh? :) We don't get asked - we have cameras watching our every move. But in a country where poverty is rampant and all around us, who can blame the stores? Not sure what it's like in Germany, but perhaps the mistrust is something they brought to America. Or it could be that we're just not able to be trusted. Lori, that's an interesting point. Maybe the Swiss can trust more than other countries because their country has so much less poverty than other countries.